Cinnamon. Toast. Bars. 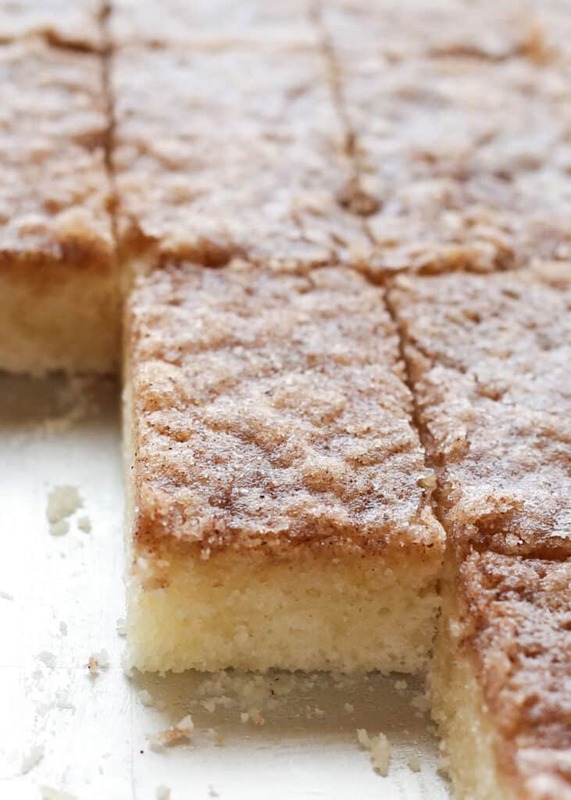 If you make nothing else that I’ve shared with you, you NEED Cinnamon Toast Bars in your life. 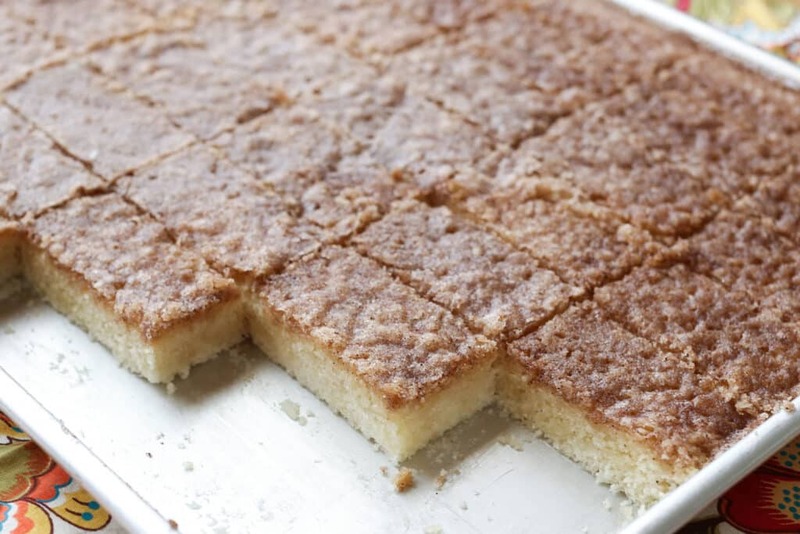 These bars are a twist on my beloved Cinnamon Toast Cake; it has been a favorite since I was a little girl. No fork or plate required this is the ultimate handheld dessert for every cinnamon toast loving person. 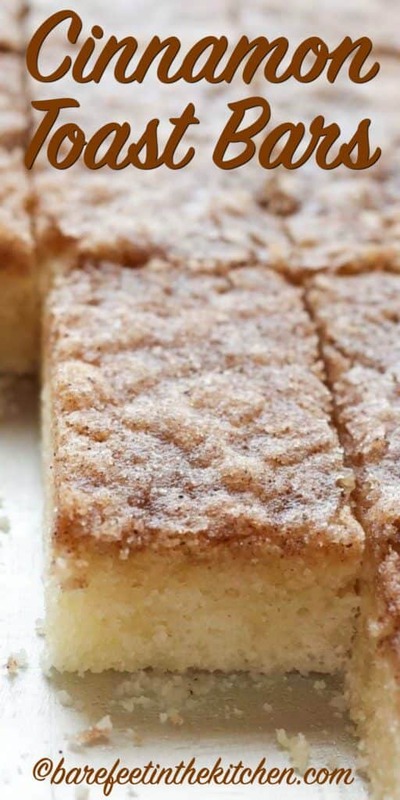 Cinnamon Toast Bars are covered in a crunchy, caramelized cinnamon sugar topping that is like nothing else you’ve ever tasted. I’ve made these bars 6 times in the past month. They are crazy good, completely dangerous, and absurdly easy to make. You don’t have to take my word for it either. Rebecca at Foodie with Family made these bars in both the traditional and vegan versions and her family and friends loved them. Her post eventually led to a community thread over at King Arthur Flour. The comments made me laugh as they proclaimed their love for the Cinnamon Toast Bars. In the fall and around the holidays there is an excuse to make a dessert almost every time I turn around. We have birthdays every month from September through December, parties and get-togethers happen almost every weekend. If you’re anything like me and want to have some simple and fantastic desserts at your fingertips, check these recipes out for more inspiration! Preheat oven to 350 degrees. Grease a large baking sheet pan (18"x13") with butter. Whisk together the dry ingredients. Stir in the milk, vanilla and butter. Pour the batter into the pan and bake for 23 minutes. While the bars are baking, combine the topping ingredients and whisk together. Remove the bars from the oven after 23 minutes and pour the topping over them. Bake an additional 8 minutes, until the cinnamon layer is bubbling. Let cool before slicing into bars and serving. Enjoy! Pour the topping around the sides of the bars first and then lightly across the top. I've found that if I pour it all on the center of the bars immediately, that will cause them to fall slightly. Still delicious that way, but not as pretty. My boys would love this with their breakfast on a snowy morning. Or any morning! Love that it's gluten-free. Thnx., we'll try this soon! Those look delicious!! I assume if I have a gluten free flour mixture that I like, I can substitute 4 cups of it in this recipe. My guess is that it will work fine, but I haven't tried it myself. I'd love to hear back if you do make them, Natalie. Let me know what blend you used and how it worked! IF what you like for flour is part coconut flour, your cake MAY turn out dry. Only because coconut flour needs more moisture. It is cheaper by far to use a gluten free blend that comes in a bag. Walmart has a good one that works well. My mom made us cinnamon toast and hot chocolate for breakfast in the winter. No wonder I have a craving for sweets for breakfast! We are highlighting everyone's Holiday Best at Tumbleweed Contessa. I'd love it if you shared this with us. I completely agree, these bars need to be in my life! Love the look and sound of that crunchy topping. These would have been so good on a recent birthday cake table. The crunchy cinnamon top sounds like a nice contrast to the moist and fluffy cake underneath! I just made this in a dairy free version (to share with a vegan friend) and I have to say WOW! They're amaaaaaaaaaaazing! Curse you! My jeans will be tight from this day forward! What did you use for the dairy...Earth Balance or Coconut oil? 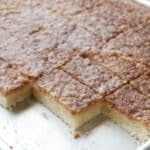 Hello - I am in the process of making these, and based on the directions, they should be ready; however, there is a layer of liquid butter on the top of the cake. I double checked the topping measurements, and I incorporated the ingredients for the topping as directed. Without being in your kitchen, I can't guess what might have gone wrong. There shouldn't be a layer of butter on the top of the cake. The cinnamon sugar layer should be bubbling. Hopefully, it worked out for you! i have baked these many times! so. very. yummy! i linked to this post on my blog tonight. :) thought you'd like to know! Where is traditional recipe? Thanks! The note for Traditional is at the bottom of the cake ingredient list. I missed it initially as well. Thank you for your site. I have been fighting gut issues for years. Also have thyroid problems. I've just gone through a cleans and would like to keep my gluten and sugar low. I love baking, and would love to have food that taste good, and that my husband would eat. Took this to work for a Mondayitis atidote and my colleagues absolutely loved it. Thank you. These are fantastic! I have made them 3x now. The first time I goofed up and used a 9x13 jelly roll pan and baking soda instead of powder. They puffed up and the butter topping oozed all over but they still got RAVE reviews. But I make them exactly as you write in the recipe and they are easy and AWESOME!! Thank you for sharing!! !